John Sims (aka Teflon), a Kentish man, was born in Farnborough in 1950 and grew up in Chelsfield, near Orpington. A winning picture of a Wellington Bomber painted in a primary school best artist playground competition was the beginning of a realisation that maybe talent exisited. John would listen for hours on end to his grand parents records on their Dansette record player at 78, 45 or 33rpm: Connie Francis, Pat Boone, Russ Conway, Mrs Mills, Elvis Presley, Billy Fury, Danny & The Juniors, The Hope Brothers and Bill Hayley and The Comets. Art though was in his blood and at 16 years old John won awards and prizes in a local art competition and this was the beginning of a career in graphic design and art. A bit of a Mod, John was inspired by the music of The Beach Boys, Rolling Stones, The Kinks, Small Faces, The Animals, Them, The Pretty Things. Then at a dance at the Spitfire Club, Biggin Hill, John was caught up with the infectious, rock steady sound and beat of Trojan and ska music. The fashion of flaired check pattern hipsters, striped college scarf and dessert boots now turned to Ben Sherman shirts and Fred Perry T-shirts, two-tone trousers, thin red braces, black loafers, crombie jackets with thin red handkerchief and a skinhead or college boy haircut. In the swinging 60’s, John made the decision not to go to Ravensbourne Art College but instead joined Geoffrey A. Wright Studios in Covent Garden, London as a trainee commercial artist and illustrator. He stepped into an exciting world of working on film and leisure accounts such as Dr Zhivago, The Man From Uncle, The Avengers TV series and the Rank Organisation Carry On films. It was a small studio but music connections were there. Friend and general artist Bill Fyfield was a drummer in an Essex band called Legend and Bill went on to became the drummer for T-Rex. Fellow trainee Gary Green joined the band Gentle Giant as guitarist and their paths were to cross again when John joined Chrysalis Records. John had a stint at ‘sweatshop’ Cleverley Meiklejohn Studios on agency presentation work for clients like Leyland, Schweppes and Cadbury’s which were all part of the learning curve of design discipline. He was then offered a graphic designer position with the growing and successful Russell James Studios, who had begun to dominate the London West End and provincial theatre advertising and poster designs. John worked within the small studio in Poland Street, London W1 on productions Hair, Oh Calcutta, Grease, Godspell, Jesus Christ Superstar, Fiddler on the Roof, Catch My Soul and the Moss Empires account which included the London Palladium. Designers and illustrators Barry James, Russ Eglin, John Farley, Ken Paul and studio manager Peter Cook were John’s colleagues, mentors and inspiration. A defining moment in John’s early career was when he saw his graphic design illustration as a 30 foot display for the theatre production of Billy starring Michael Crawford at the Theatre Royal Drury Lane. Russell James progressed with great success and took over the advertising agency United Kingdom then in Regent Street, W1. John was there for a few years but decided to move and briefly joined rival advertising agency Stewart & Jeffries. Going freelance was always part of the bigger picture and he then formed a design consultancy Art Attack at the offices of Gilchrist Studios in London, EC1 with colleague and great friend Danny Claridge. They found though that it was commercially hard to survive and break new ground and Danny eventually moved to Promotional Campaigns before becoming Creative Director of Marketing Triangle. John continued to freelance and picked up a new client, Chrysalis Records, in the late 70s through former artwork friend and then art director John Luc Epstein. Peter Wagg suddenly was appointed as the new Creative Director at Chrysalis and then continued to use the creative services of John as a freelance graphic designer. Chrysalis were very successful and moved to new offices in Stratford Place, London W1. John was offered the job of Art Director at Chrysalis Records by Peter Wagg working on music acts: Blondie, Jethro Tull, Leo Sayer, Rory Gallagher, Stiff Little Fingers, Ultravox, Generation X, Billy Idol, Spandau Ballet. 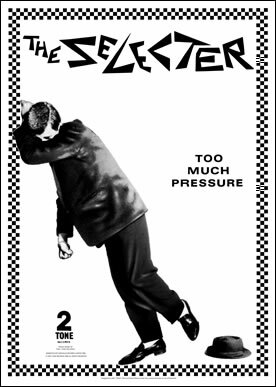 His best known work from this period was for the cult group The Specials, Selecter and the record label, 2-Tone. Nicknamed “Teflon” by his Chrysalis compatriots not for his non-stick designs, but by the way he held a table tennis bat in the record company’s games room. Not many knew of John Sims, but most people knew of Teflon including George Martin as he presented a signed copy of his biography. In 1980, John won the NME Best British Single Award design. 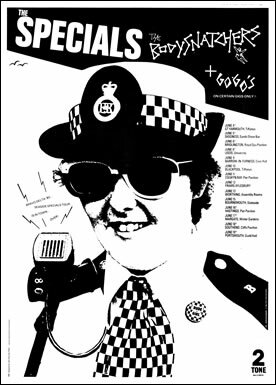 In 1981, two D&DAs and a co-director award with Martin Baker for the Runners Up in the Record Business Best Video Production. The Chrysalis creative team, at this time, also included and was led by Creative Director Peter Wagg, Designer David Storey and PA & Video Co-ordinator Carole Burton-Fairbrother. David and John formed a good friendship which has continued through the years working on projects and they worked together on The Specials single: Ghost Town and The Selecter album: Too Much Pressure. All good things come to an end. The Specials split. Jerry took The Special AKA onto the next chapter of success, while Terry, Neville and Lynval formed Fun Boy Three with John designing their album sleeve. 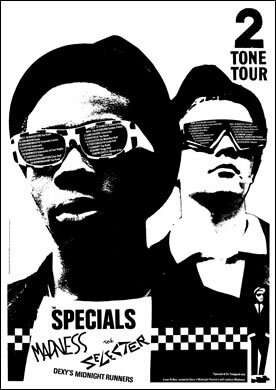 David Story took over the 2-Tone design baton for the second stage of 2-Tone, The Special AKA and Fun Boy Three. An opportunity arose in 1983 for John to become Creative Director of Zomba and Jive Records. John set up an in-house studio from scratch at their offices in Willesden, London and worked on bands such as Flock of Seagulls, Tight Fit, Roman Holiday, Billy Ocean, Comsat Angels, Ma Mas Boys and the successful Shape Up and Dance series with various personalities such as Lulu, Jay Aston and the late George Best. John parted company from Zomba/Jive a year and half later which led to forming his own design studio Bouncing Ball Design in Clerkenwell, London EC1 and then in Hoxton, London EC2. John recruited designer Peter Copley who was integral to the success of Bouncing Ball with John and was a massive 2-Tone and Specials fan. They worked together with Jerry Dammers on the Specials Singles album cover design and Specials Live at the Moonlight Club album. A successful 12 years was seen working on projects for Selfridges, LloydsTSB, Cellnet, Clairol, Schwartzkopf, L’Oréal, Chrysalis Television, Max Headroom, Inwear Matinique (with David Storey), British Airways, Proto Records, Impulse Promotions, Fruit of the Loom, Interglobe, Hackney Council, High & Mighty, Mach 1 Couriers, A to Z Couriers, Champion Records, Polo Records, Production House, Swanyard Records, Stringfellows, Swift Aerospace and Robert May Shopfittings. Record sleeve design included Divine, Salt N Pepa, Raze, Technotronic, Baby D, DJ Jazzy Jeff & The Fresh Prince and Whistle. Life changes saw a new direction. John formed Picture This (www.picturethisdesign.co.uk) as a new trading style, then moved from London to Folkestone. John continues to design for London and UK accounts and new clients on the south coast. In 2006 John married his soulmate Yvonne, they live in Hawkinge with their two cats Duffy and Lily.